10 Ways To Eat Out On A Budget… And Still Have FUN! My wife and I eat out all most every Friday evening. There’s something about the idea of coming home and cooking another meal on that last working day of the week that’s just too much to bear. An occasional modest meal at almost any restaurant can be enough to finish out the week on a positive note. 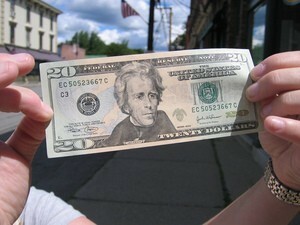 When we go out for supper, 90% of the time we aim to keep the total tab within a dollar either way of a 20 dollar bill. That’s a petty cheap evening out even for our midwest city of 85,000. #1 Order only water to drink with your meal. Restaurants make big money off soft drinks and alcohol. A Coke from their dispenser costs them mere pennies. On your tab, it can easily be $2. Water is zero calories, zero fat, and it’s still usually free. #2 Buy one get one free. This offer, usually with a coupon, is the best thing going. In today’s economy, restaurants are clamoring for more customers. Watch newspaper ads, insert fliers, and often when you eat at an establishment they will give you a discount coupon for next time. Don’t forget the restaurant’s corporate website. Often you can download a coupon for a special offer. #3 Skip the appetizer and dessert. I haven’t ordered an after-dinner desert in a restaurant since… forever. Instead, we sometimes go out for a Saturday afternoon and as a special treat we order only the dessert. That way, we’ve enjoyed an outing that was reasonable in price and we didn’t overeat. Plus, places like Applebee’s have desserts to die for. #4 Watch for restaurants offering lower priced meals. It’s a common occurrence these days. Many popular food chains are cutting prices to bring in customers. It pays to shop around. #5 Go out for breakfast or lunch (instead of dinner). Dinner is prime time in the restaurant world. The prices are higher and the portions are larger. The lunch menu will probably have most of what is offered for dinner, but in smaller quantities and at lower prices. 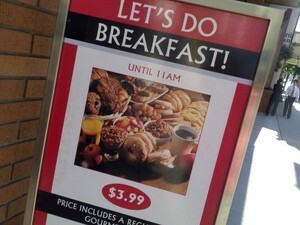 Breakfast is universally cheaper than any other meal. It’s just as nice to get away in the morning as it is in the evening. Plus, many places offer breakfast around the clock. #6 Eat out early in the week. One of our favorite places is a Chinese all-you-can-eat buffet on our end of town. If you go early in the week, the charge is almost $2 per person less than if you go on a Friday or Saturday. Mondays are usually dead in the restaurant business, so many will lower their prices to bring in customers early in the week. #7 Birthday person eats free. Most national chains and many local eateries offer Birthday Clubs of some sort. The birthday person usually eats free when 2 or more dine on the person’s birthday (or during the month of the person’s birthday). #8 Order large and take home. Many suggest ordering a half order. In my opinion, that’s a poor choice as usually a half portion is only discounted about 15% from the cost of a full-sized meal. It’s better to order a large meal and eat only half of it. Ask for a doggie bag and take the remaining half of your meal home for tomorrow’s lunch. It’s a better use of your money. #9 Order the Blue Plate Special. Daily specials are usually at a reduced price to entice people to order up. Making a larger batch makes more money for the restaurant and they usually pass on some of the savings to the customers who take advantage of their Blue Plate Special. #10 Take advantage of catering schools. Is there a catering school or chef school in your area? Culinary students need to practice on real people to build their skills, so schools usually offer some really good high-class vittles at dirt cheap prices. Both the food and the service is part of their curriculum. When I lived in Denton Texas, the local college had a very active restaurant management program that included chef training. They operated from what was a closed down Holiday Inn next to the college. Every month on specific days you could make reservations in advance to be part of their class. They had the finest linen tablecloths and napkins, well-dressed servers, and you received the published meal for the month for about 1/3 the cost you would expect for an upper class restaurant. Their program was top-notch. We attended regularly and the food was always excellent. ;eating out doesn’t have to be expensive. Off the top of my head, I can count about 15 different Chinese restaurants within 10 miles of my home. Any one of them will satisfy our desire for an evening out for under $20. Locally owned eateries are everywhere, and you always get a good meal for a reasonable price. Being on a budget doesn’t mean you have to eat from a drive-up window. It’s sometimes even cheaper if you don’t.